[ACT](RC)[1/Turn] Generation Break 1:[Soul Blast (1)] Choose a card from your opponent's drop zone, your opponent calls that card to his or her open (RC), and at the end of that turn, retire that unit. 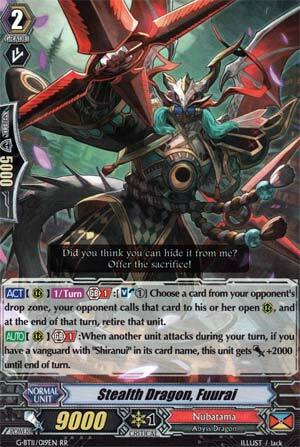 [AUTO](RC) Generation Break 1:When another unit attacks during your turn, if you have a vanguard with "Shiranui" in its card name, this unit gets [Power]+2000 until end of turn. As a free source of columns though, this card has uses. Don't look to spam this though.